Sunday night dinners are usually hit-or-miss; because I’m at home doing avoiding work, I try to find an ambitious recipe that takes a while to make. It’s my treat to myself after a long day of studying…At least, that’s what I tell myself as I’m eating it. But then there are nights when I want something fresh and simple. The thought of rolling out a pastry crust or creating an elaborate casserole is almost too much to bear, and so I gravitate toward easy recipes with minimal steps involved. Tonight was one of those nights. 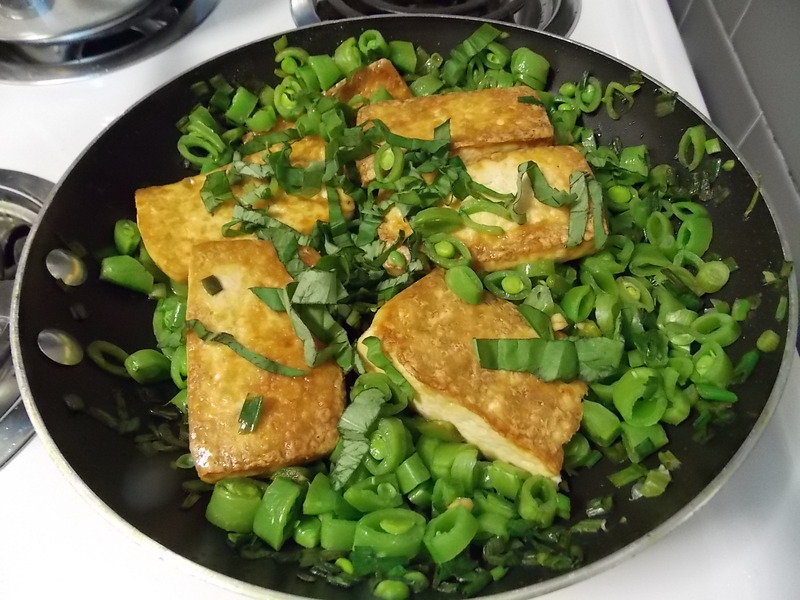 I invited my friend Lyz over for dinner, and she played sous chef as we made tofu stir fry with sugar snap peas. Because Lyz is a vegetarian, and I don’t eat meat, we’re always on the lookout for quick, simple recipes that are vegetarian (and wallet) friendly. If, like me, you’re a little freaked out by the word “tofu,” or your only encounter with it was as a seven-year-old watching Doug Funnie, never fear! This recipe is relatively straightforward, and sounds more intimidating than it is. I’ve never cooked tofu before, so there was a bit of a learning curve: The first step of the recipe tells you to drain the tofu between two plates, which seemed bizarre. It even told me to put a “weight” on top of the plate to squeeze out excess liquid. I used a new bottle of olive oil, which teetered precariously over the top of the china plate. Lyz and I were surprised at how sturdy the tofu was, and how much liquid actually drained out. We cut up the slices of tofu, placed them in piping hot peanut oil, and then seared them for a few minutes before adding the vegetables and sauce. The standout ingredient in this recipe is definitely the sauce; Lyz and I substituted peanut for the fish sauce, and it still tasted delicious. If you don’t already own peanut and sesame oil, I would highly recommend buying a small bottle. I’ve always shied away from cooking Asian food at home because of all the sauces involved, but then I realized that a small investment in the sauces would pay off; you can create a variety of dishes (including stir fries) with the oil. And more than olive or vegetable oil, it will give your food a distinct, nutty flavor. Lyz and I were proud of the finished product. It took a little longer than we expected to cook the tofu (we put all the slices into the pan at once), but all the waiting was worth it. The recipe makes enough for two, plus leftovers you can bring to work/school for lunch the next day. Drain tofu, wrap it with a clean dish towel or several layers of paper towels and place on a rimmed plate; top with another plate and a weight (a can works). Let drain further. Meanwhile, make the sauce: In a small bowl, combine garlic, chiles, soy sauce, ginger, lime juice, sesame oil, peanut oil and honey. Unwrap tofu and cut crosswise into 3/4-inch-thick slices. Pat slices dry. Heat a large skillet over high heat until very hot, about 5 minutes. Add peanut oil and let heat for 30 seconds, then carefully add tofu. Don’t touch tofu for 2 to 3 minutes, letting it sear until golden brown. Flip and sear for another 2 to 3 minutes. 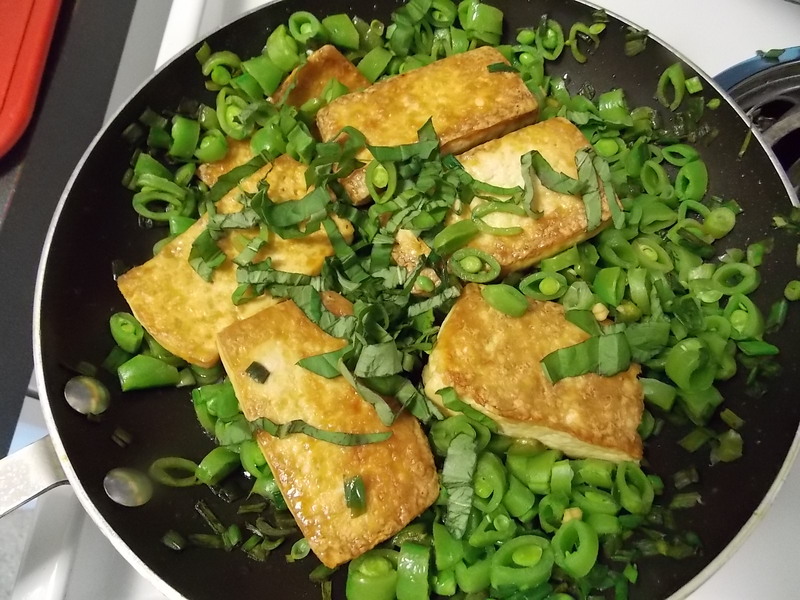 Move tofu to one side of pan (or stack pieces on top of one another to make room in pan), then add sugar snap peas, scallions and, if needed, a few drops more peanut oil. Stir-fry vegetables until they start to soften, 1 to 2 minutes. Add sauce and stir well, cooking until peas are done to taste, another minute or 2. Spoon sauce all over tofu, unstacking it if necessary. Sprinkle sesame seeds over tofu and vegetables and serve over rice, sprinkled with basil. This entry was posted in Dinner, Uncategorized, Vegetarian and tagged Asian, dinner, Doug Funnie, easy dishes, fast dishes, killer tofu, peanut oil, peas, scallions, seared tofu, seared tofu with sugar snap peas and sesame seeds, sesame oil, stir fried tofu, stir fry, sugar snap peas, sunday night dinner, tofu, vegetarian, vegetarian dinner, vegetarian main dishes. Bookmark the permalink.